One of the handsomest and possibly most noble looking of all the Spaniel varieties, the Field Spaniel has had a chequered career since the breed evolved some 150 years ago. At several points over the years the breed has sunk very low in numbers, in the last century three revivals have taken place, the last as late as the 1960s. Numbers have increased considerably in the past ten years, and whereas at one time a Field Spaniel was rarely to be seen at shows, now many open shows put on classes for the breed as well as the majority of championship shows and group shows. As they have become better known, so has the popularity of the Field Spaniel increased, but many of those enquiring for one of the breed to own as a pet and companion have never seen one outside the pages of a book, and so have no idea of the character of the breed or what is involved in the keeping and training of a Field, whilst those seeking a new breed with which to enter the realm of dog shows have little idea of Field Spaniel blood lines, history, or even the type of dog to aim for if they are to have any chance of success in the rings. It is for this reason that the Field Spaniel Society issues this leaflet in a desire to assist would-be owners. The Field Spaniel is a true country man, active tireless and inquisitive. He is not a dog for those out at work all day who mean to leave him shut indoors alone for hours on end. Be sure he will protest long and loudly and annoy the neighbours, or vent his frustration by ripping the chair seats, chewing slippers, or removing wallpaper as would most dogs. This is a loving sensitive breed, who likes to be with people and to take part in all that is going on. Nearly all Fields are avid travellers, loving the motor car and often quite content just to sit in one even if not going anywhere. They are not naturally obedient nor are they quick learners, but have to be taught firmly but gently from an early age what they may do and not do. Shouting, beating or any form of violent treatment will get you nowhere with a Field. Stern looks and words and a good shaking when he has been naughty usually works. Do not imagine that because your dog obeys you one day, he will do so the next. A Field really needs to know his lessons well before he can be entirely trusted to carry out your bidding and even then, such is his sense of fun and desire to make everyone laugh, he will forget all he has been taught and do something quite absurd. This is one of the larger of the Spaniel breeds, with a weight scale up to 20-25 kilos, and they are great feeders, especially the growing puppy who needs a great deal of the correct type and quality of food at regular hours if he is to grow into a satisfactory specimen. People buying a Field puppy and then feeding it like a Cocker will end up with a weedy, undersized and not very good looking Spaniel. The breed, with it's highly developed sense of humour, loves to please and be praised, he is wilful and has a healthy streak of naughtiness but a loving affectionate nature. They are hardy dogs, at their best when living a natural outdoor life with plenty of exercise and fresh air. Owing to their normally good coats, Field Spaniels are easy to keep clean and smart, the removal of surplus hair under the ears, and on feet and hocks being all that is required for most specimens, while a daily grooming will keep his jacket shining and healthy. The Field Spaniel is a true dual purpose spaniel, and those winning on the bench perform equally well in the shooting field. If started young and trained sensibly and slowly, the large majority of the breed take readily to work. An excellent rough shooter's dog with a keen nose, willingness to face the heaviest cover, excellent in water and utterly tireless. Not natural retrievers they mostly have to be taught this young, but once learned, the lesson is never forgotten, and they have tender mouths and are good on wounded birds. 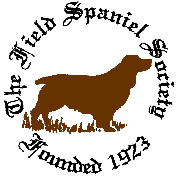 The Field Spaniel Society manages all the affairs of the breed, promotes the working side, organises seminars on the breed, stages a Championship Show and an Open Show each year, and prepares and publishes a list of judges acceptable to the Society. Each year the Society publishes for its members a year Book and Newsletter.